"My friends and I were desperate for a night in where we could catch up and feel pampered so I looked around and found Lifted Spirit.The whole evening was perfect, we all went home feeling relaxed, happy and were all able to catch up and have a proper girly evening.�We will definitely be using the girls at Lifted Spirit every time, in fact our next pamper party is already booked.�Thanks again Jodie who made the whole evening such a pleasure." "I have asked Jodie from Lifted Spirit to run several fantastic pamper parties for me and my friends. She is a warm, lovely lady (and now friend) who provides a professional service while managing to put you all at ease. You eat, dink and chat away with friends while one of you sits and relaxes while Jodie gives you a great manicure or pedicure. At one party Jodie set up the massage bed for treatments in one room while her assistant set up a nail bar in another room. Ultimate pampering and relaxation. I would definitely recommend to all Local Mums!" No one needs an excuse for pampering especially not us! How about you? Lifted Spirit�love pampering! Any occasion is a good occasion for a pamper party: Hen party, birthday, pre prom, baby shower or girly get together, we can do them all. We provide quality mobile beauty and holistic treatments in the comfort of your own home or venue. Take a look at our treatment list and choose from manicures, pedicures, massages and facials. The list of pampering pleasures is endless! Lifted Spirit�bring luxury beauty treatments and Fabulous Pamper Parties to the comfort of your own home, office or event. Whether you are looking for a pamper party or Spray tan party for a baby shower, birthday or an excuse to get the girls together. Or maybe you want to try our luxurious SPA FIND body treatments, Shellac Manicure or pre-holiday wax and pedicure? You're at the right place! Lifted Spirit�then grew to provide pamper parties for every occasion from glitter parties for little girls, pre-prom for teens to hen dos. Really we don't need an excuse for pampering and a party. With a team of qualified and fully-insured therapists,�Lifted Spirit�can bring the luxury treatments to you. With our pampering coffee mornings or pamper evenings, we have it all covered. "If you’re looking for a bit of grown up ‘me’ time in beautifully presented surroundings, but still need somewhere to store or entertain the kids, then Heaven Nutfield is the place for you. Offering a fantastical mix of spa and pamper treatments, holistic therapies, classes for grown-ups and little people, scrumptious food and drinkies for adults and children and with gorgeous little gifty knick-knacks available on sale too – this really is a little bitof grown up heaven. If you’re looking to escape the madness then there are nooks and crannies galore to explore and hide in where you can enjoy a cup of coffee or glass of wine, like the adult only gallery area. Or if entertaining the children and socialising with friends is the nameof the game, then head to the fully equipped playroom or buzzingcafe area. 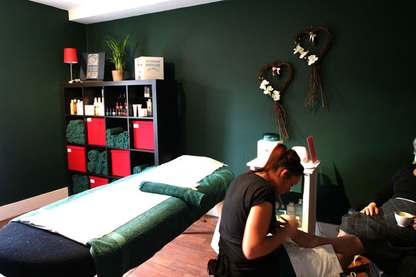 Or for the ultimate ‘Me’ treat book yourself in for abeauty treatment in one of their two therapy rooms and relax knowing the small ones are safely ensconced in the fully supervised cr�che area. I had a wonderfully relaxing pedicure by the lovely Jess and am now the owner of 10 very pretty toes. Emma and Jennifer, the founders and managers of Heaven Nutfield really have thought of everything, having clearly designed this ‘sanctuary’ with their clients comfort foremost in their minds. My only criticism? There’s not one in Epsom! Highly recommended."